Too soon for pumpkin recipes? Nope 🙂 I love fall and am soooo ready for it. The Arizona summers have been a brutal 108 degrees for literally weeks. 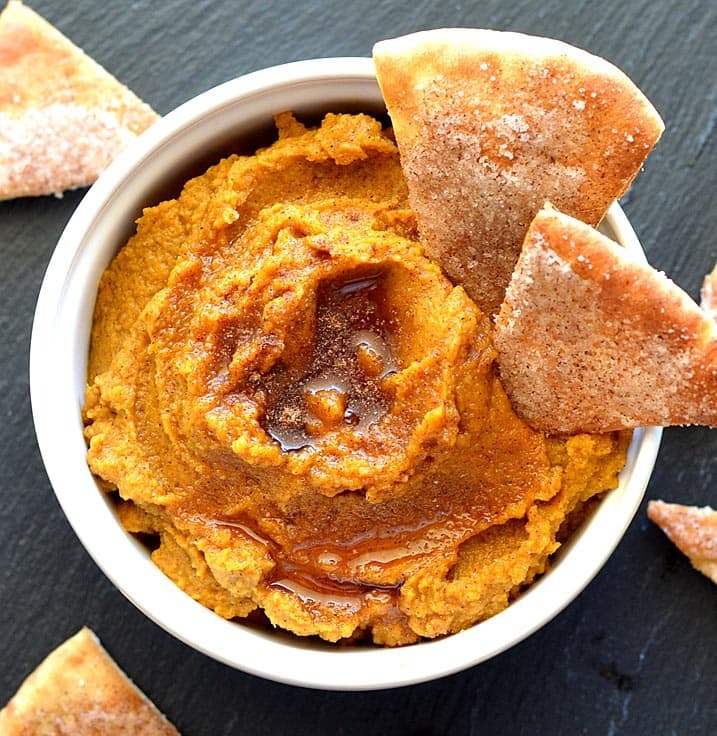 Pumpkin is my favorite flavor on this planet and fall = pumpkin, so bring on the Pumpkin Hummus with Cinnamon Sugared Pita Chips! This recipe takes hummus to a whole new level. Traditional chickpeas are combined with pumpkin puree (not to be confused with pumpkin pie filling) and flavored with pure maple syrup, pumpkin pie spice (don’t worry if you don’t have it, I provide a recipe here) and just a bit of oil to bring it all together. All of the ingredients are placed into a food processor and pureed until very smooth. Depending on the power of your processor, this might take a few minutes. Be sure to scrape down the sides a few times. There is nothing difficult at all about this recipe however, I do want to mention that removal of the skin from the chickpeas is an absolute must in this recipe. While they are perfectly fine to eat, they are not aesthetically pleasing in a recipe such as this one. Just rub them between paper towels or your fingers and they slip off easily. Don’t shoot the messenger LOL But I promise, the effort is worth it in the end. It’s an appetizer, it’s a dessert…it’s whatever you want it to be. It’s also really delicious and easy to make. Cut pita into wedges and brush with melted vegan margarine. Sprinkle with the sugar mixture. Place onto a cookie sheet into a preheated oven set at 350 degrees until golden. 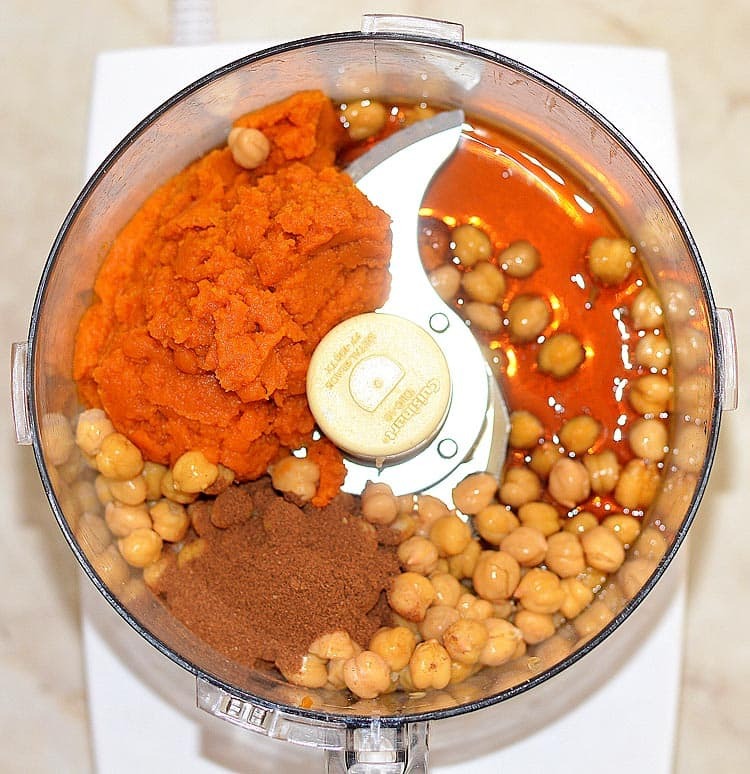 Meanwhile, place all of the hummus ingredients into a food processor and blend until smooth. 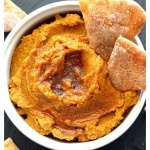 Place the hummus into a serving bowl and drizzle with pure maple syrup and a sprinkle of the pumpkin pie spice. 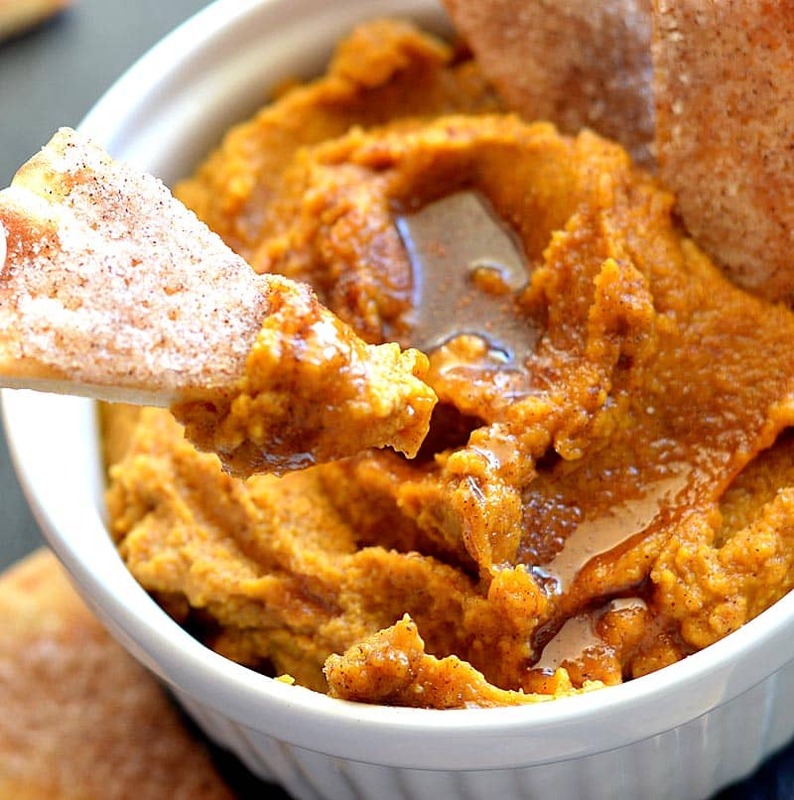 Arrange the toasted cinnamon-sugared pita chips around the hummus and serve immediately. i made this and am hopelessly addicted! over the holidsys, marketplace brand at walmart carried it, and this was just as delicious, but unfortunately seems to have been a limited edition. thank goodness for this simple and scrumptuous version!